Key point 1: Injuries from loaded guns nearly always arise from longstanding bad habits with unloaded ones. Key point 2: Being aware of how injuries happen helps people better understand what they need to do in order to stay safe. Did you ever wonder — and yes, I know this is a little morbid, but bear with me — about the ways that people shoot themselves unintentionally? Or about the type of injuries they are most likely to get? Not talking here about people who inadvertently or even recklessly shoot someone else. Or about someone who shoots themselves or someone else on purpose. I’m talking about good people, people like us, who simply make a terrible mistake. These are people who are stone-cold sober and possibly even supervised at the range, but who fire a round without meaning to and somehow shoot themselves when they do. Did you ever wonder which body parts they were most likely to hit, and why? There are two body parts most at risk for an unintentional self-inflicted gunshot. Assuming a right-handed shooter, 1 the two body parts most at risk are the left hand, and the right leg. 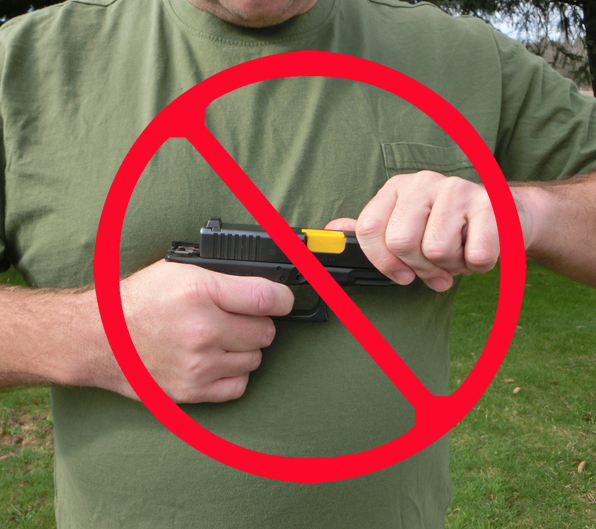 Racking the slide with the hand forward of the ejection port can lead to serious injuries. Injuries to the left hand can happen when a person gets the non-dominant hand out in front of the muzzle while shooting (often during the draw). They also happen when someone habitually puts the pinkie and ring fingers on or just forward of the muzzle while racking the slide. A person can also suffer a detonation injury when yanking the slide back with a palm over the ejection port, especially on the unlucky chance that the ejector pierces the primer when the slide moves. A left-hand injury can happen when a shooter has a poorly-fitting holster or floppy belt, and so holds onto the holster with the left hand while putting the gun back into the holster with the right. This motion puts the left hand directly in the line of fire in case of a noisy mistake. Left-hand injuries also happen in gun shops and gunsmitheries, where (for reasons I have never figured out), we sometimes see a shopper point the muzzle into their own left hand while pressing the trigger. The other body part most at risk is the right leg. Almost universally, injuries to the right leg happen either during the draw, or during the reholster process. With few exceptions, mistakes made while drawing or reholstering create the bulk of serious injuries that happen to experienced shooters. While these injuries usually track straight down the outer side of the right leg, and can be relatively minor, they can also cause very serious and even life-threatening injuries to one or both legs. They can also injure the shooter’s left hand at the same time, as discussed above. They can destroy the knee or the ankle joint so severely that the person becomes crippled or semi-crippled for the rest of their life. And this type of injury can kill, especially when the bullet strikes an artery or does a lot of damage to other structures in the leg. Putting the handgun into the holster is the single most dangerous thing most concealed carry people ever do with firearms. Far too many concealed carry people do not realize this, and do not take steps to prevent this type of injury from happening to them. They don’t know to keep the left hand anchored well out of the way during the draw and reholster process. They don’t know to move the finger away from the side of the gun as they reholster. They haven’t thought about how injuries can happen, so they don’t realize what they need to do in order to stay safe. Not only this, but one of the most common holstering behaviors of all is also extremely dangerous — and most people who do this behavior do not even realize they are doing it. A few people even do it on purpose, thinking that it’s a good thing. This common habit leads, directly or indirectly, to nearly all injuries that happen to people while reholstering. Tune in tomorrow to find out what that one most-dangerous habit is, how to avoid it, and what to do instead. One Response to Which body parts…?